ELEONOR BOSTRÖM: I have always drawn a lot, built stuff, and crafted since I was a kid. As a child, I submitted my drawings to competitions that I found on the back of cereal boxes. I even won my first portable cd-player in the 90s through one of those competitions! After finishing my compulsory education, I studied art history at the University in Stockholm and as interesting as I found that area of study, I knew that I was not passionate about this subject matter. As a result, I started working as an assistant to a ceramicist. After that, I studied at two different preparing art schools for two years, testing out all kind of crafts, including ceramics and sculpture. What I loved about ceramics was that I could bring drawing into it as well. When I was attending art school, I found that it was difficult to determine what to do after graduation. One of my former classmates had a difficult time making a living making her art. Before I finished art school I made sure that I already had a cheap studio rental with a kiln, so I could continue working straight away after earning my bachelor’s degree. During the first few years after graduation I worked a lot in elderly care and as a hotel breakfast hostess to make ends meet. This did not leave much time for studio work. Today I would say, four years after completing my bachelor’s degree in fine art, I’m sure about what I want to do. But I’m still in this phase where I work really hard, but I am not making a lot of money. However, I do not mind it too much because I get to do what I love. KATHERINE CARVER: Did you study art, sculpture formally? ELEONOR BOSTRÖM: Yes, I completed a three-year bachelor’s degree in Ceramics and Glass; however, also while earning my bachelor’s degree, I worked at an old pottery learning old school throwing clay. ELEONOR BOSTRÖM: I would describe my work as — sculptures with function; and sculptural utility goods. Also, my work is playful, unique, and cutesy. KATHERINE CARVER: Can you describe the time when you first realized that making sculptures was absolutely something that you had to do? ELEONOR BOSTRÖM: I think during my years in art school, I went from making functional cups and other things to creating sculptures instead. However, I love function, so I haven’t left that behind. I am always trying to incorporate function into my sculptures. There was not necessarily a first time that I realized making sculptures was something that I had to do. It has been something that has grown. When people, friends, and family want to custom order something, or when a gallery or store says it wants something precise, or something I usually don’t do, in the beginning I always took the commission, thinking I couldn’t say no to an offer or an opportunity. However, after completing the commission, I always had the feeling that it wasn’t me and I felt badly and that I was disappointing myself. Sometimes even though you have to say “no” to potential clients and assignments, the outcome is better. That sounded a bit cliché. But I think you can see it in what you do if you love it or not; and if the love isn’t there, don’t do it. 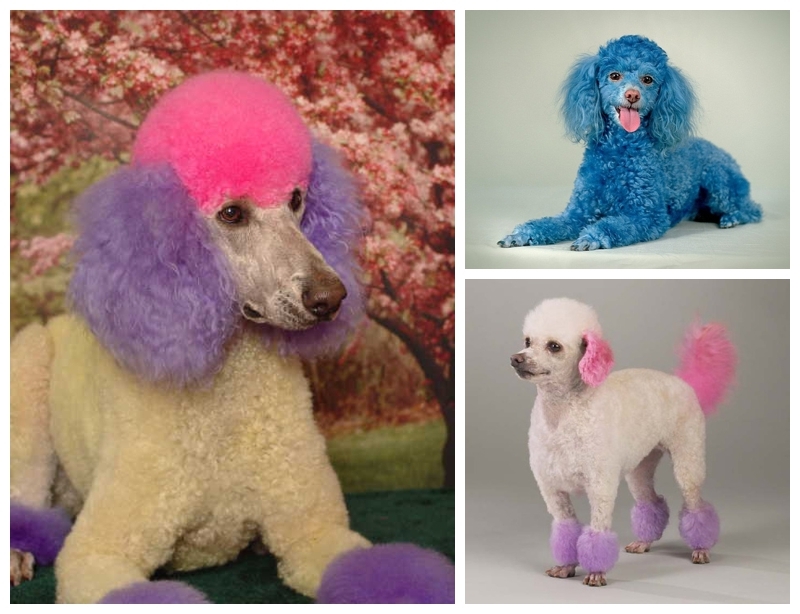 KATHERINE CARVER: What was the impetus that inspired you to begin making sculptures of dogs? 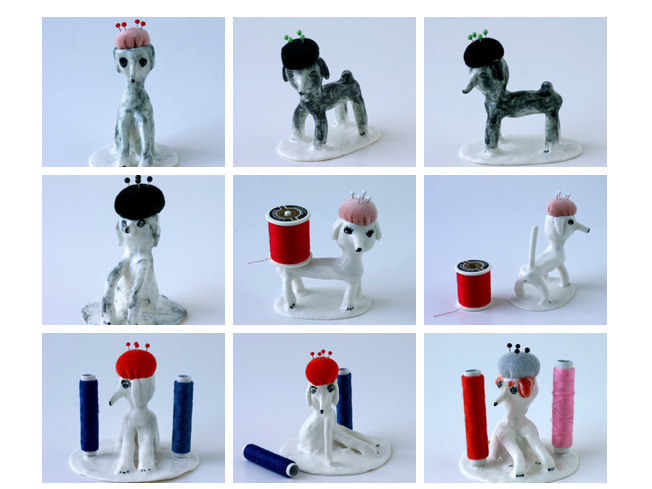 ELEONOR BOSTRÖM: I started making dog sculptures during my study abroad in the United States. I got inspired by all the colored dyed dogs and the movie ´Best in Show’ and also that I missed my dog, Tess, very much who is shown below. And from there, I have just continued. 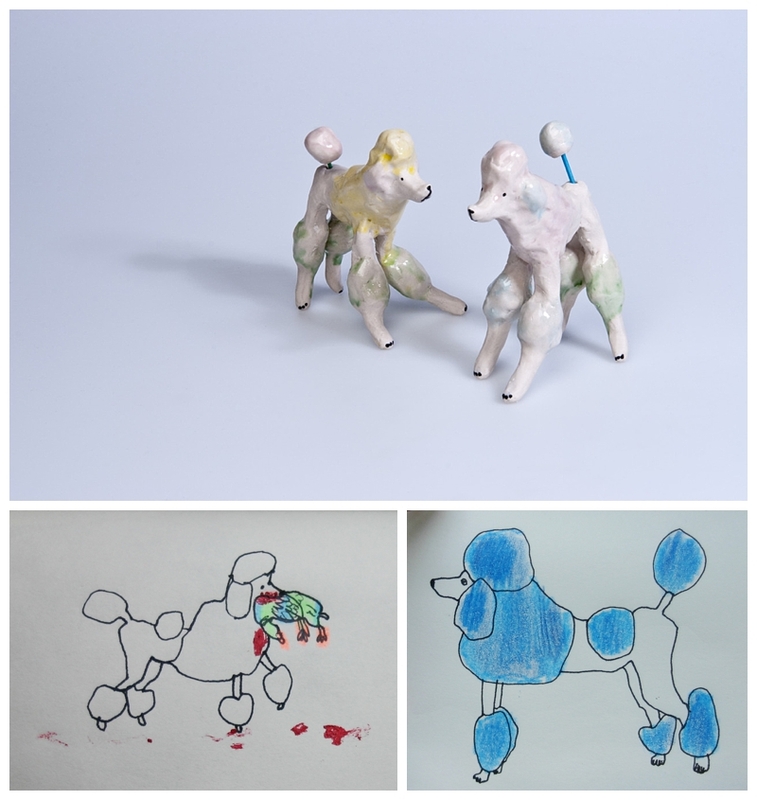 I love dogs and love making dogs in porcelain. I’ve always had dogs until recently. 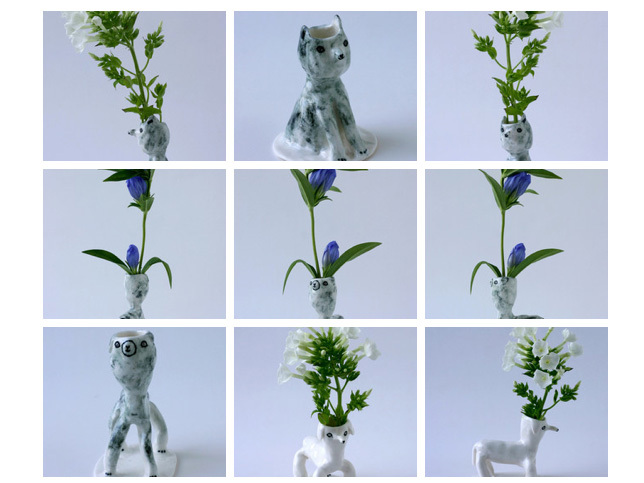 Thus, in the absence of my own dog, I enjoy making them out of porcelain! There is something about a dog’s expression that catches my eye. 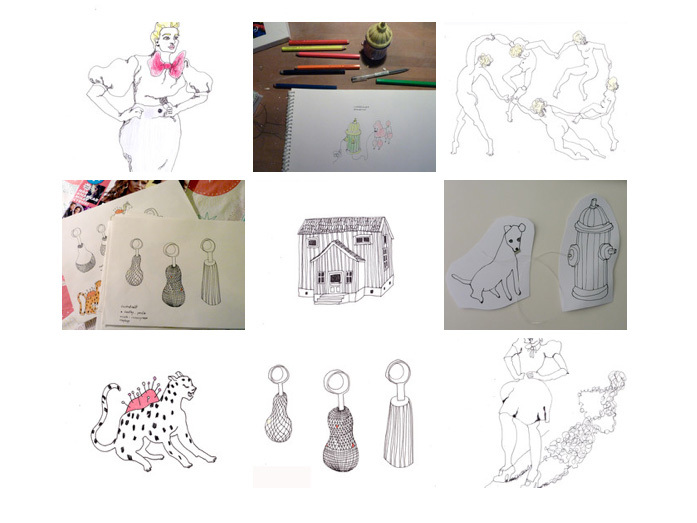 And if you look at my tumblr there are huge amounts of dog pictures and dog gifts among my work in progress pictures. (The above work is from my time studying at RISD). 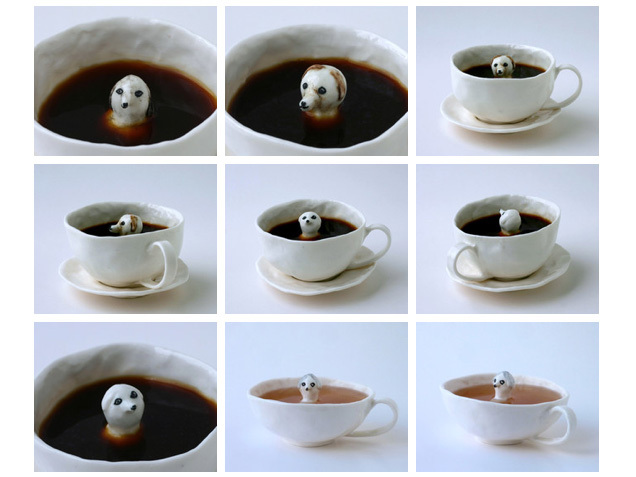 KATHERINE CARVER: Where did you come up with the idea for your body of work entitled, Dog in a Cup? 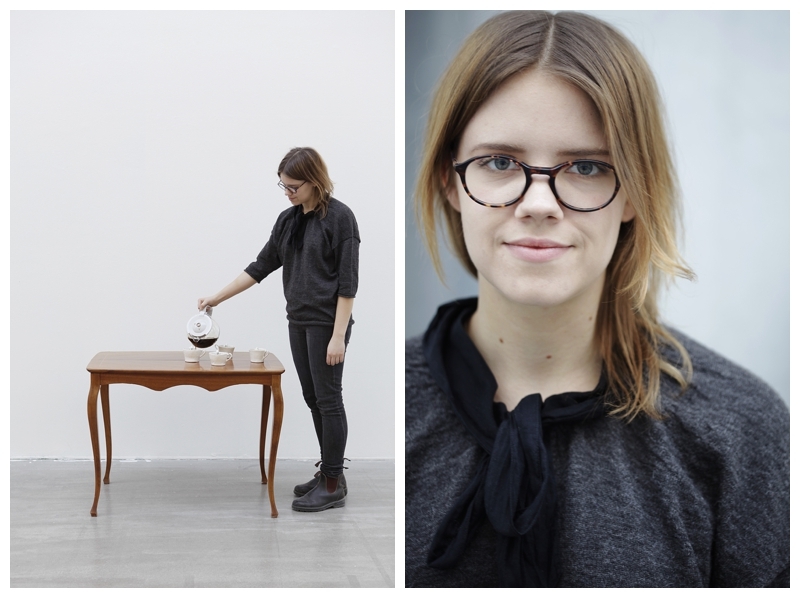 ELEONOR BOSTRÖM: By combining function with sculpture, and playing with what is functional. I like doing that. KATHERINE CARVER: Where did you come up with the idea for your body of work entitled, Functional Dog? ELEONOR BOSTRÖM: Well it’s the same as with the dog in a cup. Testing the dogs function in my tableware. Soon there will be a hallway dog that takes care of your keys. 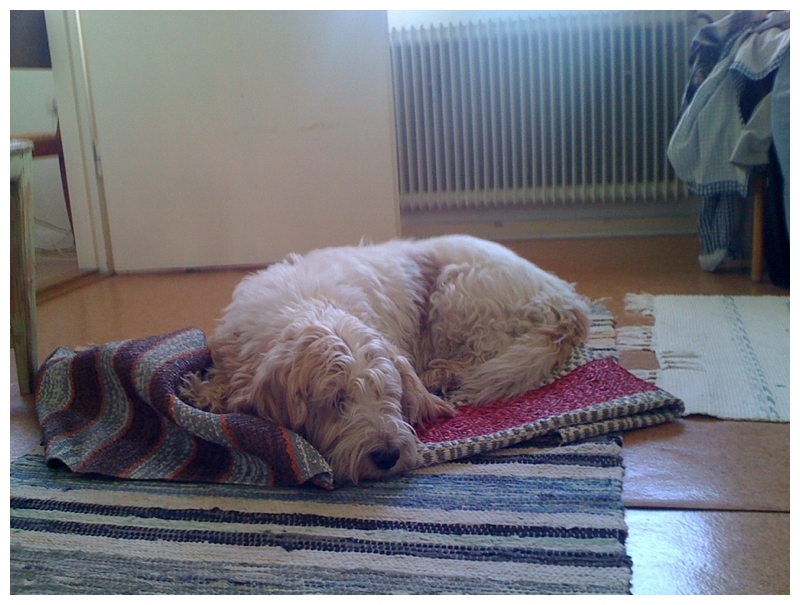 ELEONOR BOSTRÖM: Dogs influence my work very much. This is why I keep having them as a theme in my work. I’m on a constant mission to persuade my boyfriend that we are going to get a dog! (He is a cat person). (My old dog, Tess, shown above). ELEONOR BOSTROM: I exhibit in Stockholm at the co-op Gallery Blås&Knåda. In London at the Atomica Gallery and the Kapok store in Hong Kong. And I always show a lot of my new work on my tumblr and sell stuff in my Etsy store. I really enjoy the personal contact and feedback I get through Etsy! ELEONOR BOSTRÖM: Creativity is something you can apply to so many things — not just ‘arty stuff.’ You can be creative with how you live your life. How you work. How you are with your friends and family. Breaking patterns. Having a passion. ELEONOR BOSTRÖM: Making ends meet. Haha, no but yes! Sometimes I find it hard finding the time to do and test new stuff. I just keep doing the things that make my economy go around, while forgetting about evolving as an artist. ELEONOR BOSTRÖM: That people are interested in what I do, and that I’m interested in what I do. I get depressed when I’m not in the studio, knowing that the studio is where I should be. The sun keeps me going a lot too. (It is too bad we only had seven (7) hours of sun in January, a depressing month). KATHERINE CARVER: What kind of patterns, rituals, and routines do you have while making sculptures? ELEONOR BOSTRÖM: I think that I’m really structured. My most important ritual is biking to the studio — getting exercise and air. It’s a good bike distance, one hour in each direction, which entails going through Berlin’s city center, where I receive so much inspiration. Getting off track, yes while making the sculptures I’m very inpatient. Wanting it to go fast, I think is from my time working in a pottery, you had to be time efficient. So I always have about five (5) sculptures in the making at the same time, and making dog cups and others thing to, at the same time. ELEONOR BOSTRÖM: This is a hard one. I still feel so fresh out of school although it was four (4) years ago. Well, actually taking the leap and moving to Berlin from Stockholm two (2) years ago has been an accomplishment. In Berlin, I’ve been able to make a living from just doing my art. I’ve been super lucky in that respect. It is also much cheaper to live in Berlin compared to Stockholm. I don’t miss my hotel breakfast hostess job! ELEONOR BOSTRÖM: I had an exhibition in January 2014, which I worked very hard preparing for this exhibition during the fall of 2013. So now I’m recovering and taking it slow. I’m trying some new things out in the studio and working as if I was a sloth. It’s nice. But I have some deadlines, Atomica Gallery is celebrating its one year anniversary in late March beginning of April, so I’m going exhibit in their group show celebrating Atomica Gallery’s anniversary. Also, in October I’m going to exhibit in Japan in a group show – I’m super excited, and I’m going to travel there for the first time! ELEONOR BOSTRÖM: It’s hard to pinpoint, there are so many artists that inspires me. But I have had a long love for the Swedish artists – Jockum Nordström and Maria Boij (she has a lovely Instagram – mariaboij). ELEONOR BOSTRÖM: Be stubborn and keep going. And don’t overthink it in the beginning and work hard. ELEONOR BOSTRÖM: On the internet at the following websites– www.eleonorbostrom.se; http://eleonorbostrom.tumblr.com; https://www.etsy.com/shop/EleonorBostrom; and http://instagram.com/eleonorbostrom?ref=badge. All images in this blog post are courtesy of Eleonor Boström.